Sometimes I just amaze myself. Positively and also negatively. One day I was sitting over a small pile of skeins thinking what to crochet. 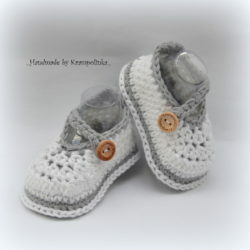 I love baby shoes so I was not hesitating long and started crocheting. Over an hour one small and cute baby shoe was sitting at the fireplace mantel. I took snap picture and post it quicly on the social network. Suprisingly it got so many likes that I decided to share this pattern. I made also a video but with a Czech comments but if you do not mind switching the sound off and just watching following the pattern, it might work also for you. Yarn: Alize Bella white 055 and grey 021 (100% cotton, 50g/180m, for US here), pictures zde I used a ball from each collor, if you crochet one-color shoe, one ball is enough. The whole shoe is made of doubled yarn. Each row starts with either 1 CH = Single Crochet or 1 loose CH = Half Double Crochet and ends with SlSt. This not apply if you use markers and crochet in circles. This pattern is written in columns that is the way the shoe is usually crochetted. Also you start with a chain and continue around this chain. continue with HDC to HDC, end with SC to HDC and SlSt, finish off the white yarn. You need to start on the opposite site where you will have the button, find the last 2HDCtog loop, from here count five loops of HDC, here you start with the grey yarn (watch video). Fold the shoe to half, find the half in the heel, insert the marker here. 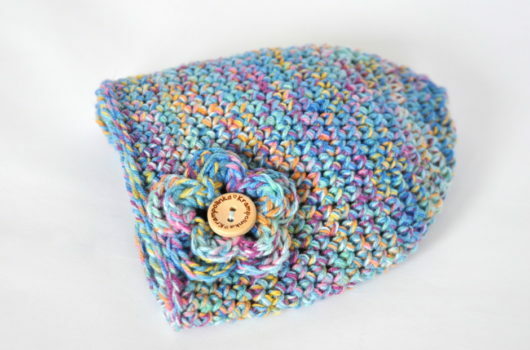 Start crocheting with grey. SC into HDC. Skip one loop before the loop with marker and make 6HDC to the loop with the marker, skip one loop after and continue with SC into HDC to the spot we started. Make SlSt. Continue with a strap. CH 13, SC to the fifth loop from the begining, then make 7 SC and end with a SlSt to the shoe. Watch the video or turn the shoe, face the strap part, you can see a thread from the third row around the sole, insert the hook to the loop and make SlSt, go around the whole sole with SlSt. I usually sew the yarn in the shoe without making knots. Sew the button. Make sure it is well sewn. Congratulation. That it is. Just to make a second one. Thank you for sharing the pattern for your lovely baby shoes. Zeptám se prosím jak dlouhá vyjde stélka v této přízi?